When you begin a game of Terraria you’ll find yourself in an open wilderness with nothing to your name but a mining pick and an axe. With these, you need to survive and thrive. Everything you see can be destroyed and collected for use later. The ground beneath you, the trees, and even the plants (such as mushrooms) can be gathered and then put to good use in items. Each small square of land is its own destructible building block. Simply obtaining raw materials by chopping them up with your mining pick or axe isn’t enough, however. You also need to create new items with them, such as new weapons, armors and special tools like the grappling hook. To do this, you’ll need to create crafting items like the workbench, which provide access to new items when you have the proper materials. You’ll only know if you have the right materials if an item shows up in your crafting menu. 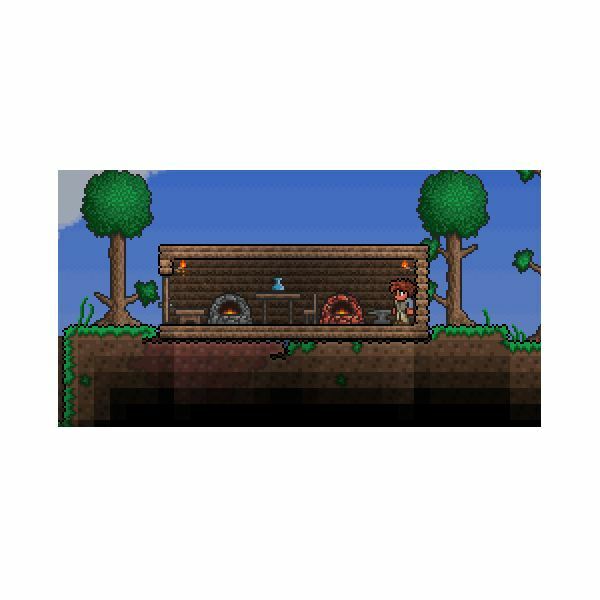 Alternatively, you can check out one of the Terraria wiki sites and read the recipe lists found there. Learning to play Terraria will require that you don’t mind a bit of combat. Even during the daytime hours you’ll have to fight back monsters, usually in the form of jellies that bounce and bobble across the landscape. You’ll find much nastier opponents in the dark, be it at night or in caves. This includes zombies, demons and more. You’ll have access to both melee and ranged weapons in Terraria. Your most basic melee weapon is the sword, which comes in a variety of types made from different materials. A sword swings in an arc in front of your character and has a slight knockback effect, making it possible to juggle opponents backwards. Success in combat with a sword depends on a timing your strikes well so that enemies can’t strike back. There are other melee weapons. Hammers can be used to knock enemies back and smash certain objects, but are generally slower and less effective than swords. Flails have a long range and will damage multiple opponents as they travel, but are a bit slow and difficult to use against speedy opponents. Ranged combat is usually performed through the use of bows and guns, both of which can do significant damage at range but also require ammo. In some cases, mana might be used instead of ammo. These weapons can be a bit expensive to rely on because of ammo costs, but are generally awesome, particularly against bosses that are hard to close into melee range with. Other ways of taking down enemies in combat include explosions and spells. These attacks can deal a significant amount of damage and are very handy against tough opponents like bosses, but they also tend to use a lot of mana or be expensive to craft. If you’ve watched others play Terraria you’ve probably watched them build large, elaborate structures. What’s not obvious, however, is why they’re being built. It doesn’t take a huge space to hold the crafting equipment and storage your average player will need, so why bother with more than that, simple curiosity aside. The answer? Non-player characters. NPCs are a very important part of the game because they offer players items that can’t be obtained anywhere else. However, the only way to attract NPCs is to build shelters that they can appreciate and use. Each individual NPC in the game will require his or her own room. This is an area that is separated from all other areas by either a door or a platform, which can be used to jump up and gain access to the room. Alternatively, you can provide NPCs with housing that’s entirely their own – but it’s possible to obtain all of them in one house so long as rooms are made available to each. Once you have the space, the only other thing you need to do is fulfill the NPC’s requirements. For example, the Arms Dealer will only show up after you obtain a firearm from some other source, and Nurse will only appear after the player improves his or her health using a Crystal Heart. If you want to be able to see the game’s most exotic equipment and beat the most difficult bosses, you’ll need to enlist the help of NPCs. 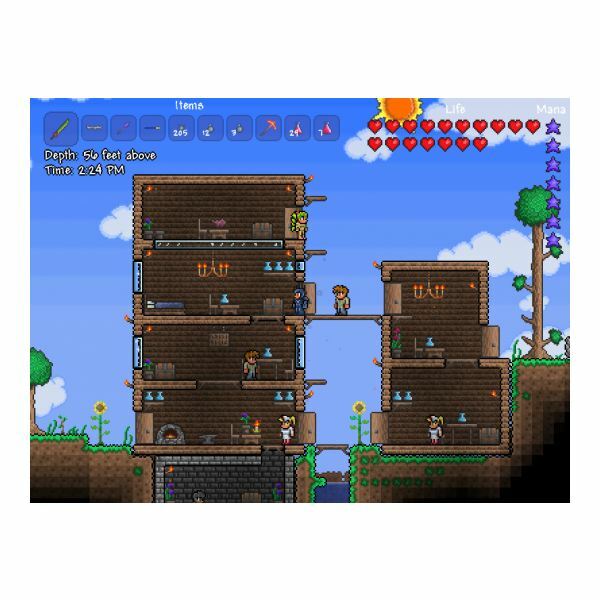 You should now have the basic information you know how to play Terraria. Let’s recap. To play the game, you first need to learn to manipulate the environment by gathering materials and using them to craft. While doing this you also need to learn how to fight opponents off. Finally, you need to use the materials you collect and the items you craft to build shelters that will keep you safe from enemies and provide room for NPCs to move in. That’s Terraria in a nutshell. Of course, it’s much more complex and reality due to the wide variety of equipment, monsters and NPCs in the game. But if you can learn to nail these basic concepts, you should be able to progress without too much trouble.